The Boston Redevelopment Authority said Monday it has received four proposals for two Roxbury, Mass., parcels that include retail, hotel and mixed-income residences. The parcels — Parcels 9 & 10 — are part of the Roxbury Strategic Master Plan designed to stimulate economic growth in the Boston neighborhood over the next two decades. • Washington Crossing Partners LLC of Duxbury, Mass., proposed a $125 million redevelopment project for both parcels with 365,000 square feet of commercial, retail and workforce housing, and approximately 250 parking spaces. The retail component would include expansion opportunities for local and minority-owned businesses. • Parcel 9 Partners LLC — a joint venture between New Atlantic Development and Nuestra Comunidad Development Corp. — proposed for Parcel 9 “Shawmut Green,” a $28.5 million transit-oriented, mixed-use, mixed-income urban village. Included would be housing — both rental and ownership — retail space and an entrepreneurship training center. • Also for Parcel 9, Urbanica Design + Development proposed Melnea Hotel & Residences, a 10-story, 150-162 room hotel with 52 units of mixed-income housing and parking for 139 cars. • For Parcel 10, a joint venture between Madison Park CDC and Tropical Foods International includes a project that would integrate the parcel and the adjacent building and land now owned by Tropical Foods with commercial and residential uses. The development program includes mixed-income residential apartments and street-level retail. The BRA said the RFPs will be reviewed internally and then presented to the community at a later date. I didn't take a look at the specifics of the RFP and the requirements included within...I'm hoping that the BRA (under the direction of the mayor) didn't allow the community to dictate the type of impossible demands and lease payments that have killed Parcel P-3...P-3 had potential but everyone wanted something out of it and by the end there wasn't enough value on the table to justify construction. No new news, just adding another story about the project from July. But why the hell did it take another year after being "tentatively designated" by the BRA as developer to get going? Is this under construction by now? A major development that will bring a new hotel, housing, and retail space to the vacant lot on Melnea Cass Boulevard was approved by the Boston Redevelopment Authority’s Board Tuesday. The $50-million project on the 1.3 acre lot dubbed Parcel 9, which is located adjacent to Ramsay Park, will construct 145-room hotel, 50 residential units, and 12,600-square-feet of ground floor retail and community space. The land is owned by the Boston Redevelopment Authority and Massachusetts Transportation Department, and was awarded to developer Melnea Partners, LLC through a public bidding process. A Request for Proposals was put out in November 2010 and three proposals were received by the BRA as of July 2011, according to the BRA. Parcel 9 was tentatively designated to Melnea Partners in May 2012. The site is also located across from the recently approved Tropical Foods project at Parcel 10, which aims to build a new grocery store, residential units, office space, and retail space at the vacant lot. ^^^^ I walked these parcels a couple of weeks ago and zero is happening. The only thing I saw were some old white stakes scattered around pracel 10. The hotel parcel requested a delay from the BRA. Mm-hmm. Great. So the developer was given the right to develop ... without funding in place? Delightful! 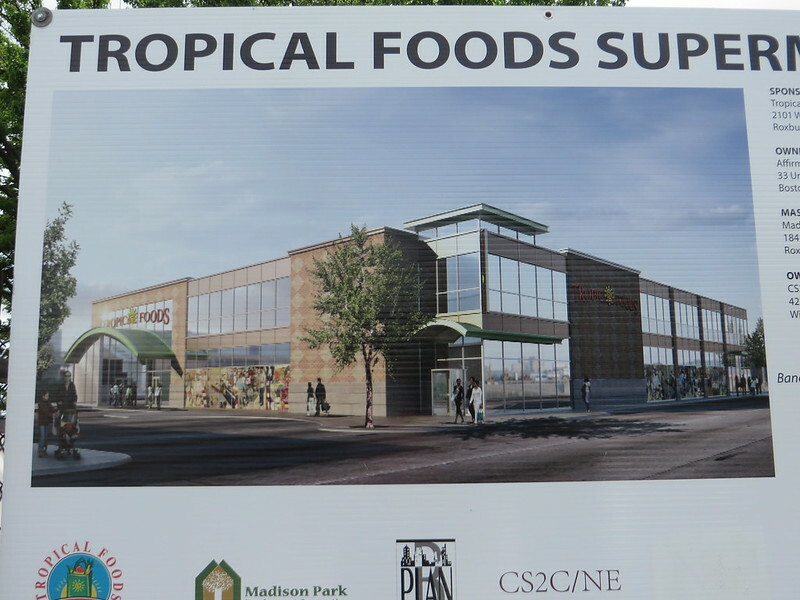 Financing for the expanded home of Tropical Foods in Boston’s Roxbury neighborhood has been finalized, allowing the first phase of development to proceed. Located on a 2-acre lot at the gateway to Dudley Square adjacent to the existing Tropical Foods at 2101 Washington St. and the intersection of Melnea Cass Boulevard, the parcel is co-owned by the Boston Redevelopment Authority and the state Department of Transportation. The project is a partnership between the Madison Park Development Corp. and the Tropical Foods grocer. The new Tropical Foods facility has a total development cost of nearly $15 million and financing for the project will utilize $3.6 million of New Market Tax Credits, provided through Bank of America, $1.4 million of MassWorks infrastructure program funding provided by the Executive Office of Housing and Economic Development and a $788,000 grant from the U.S. Office of Community Services as part of its Healthy Food Initiative. Tropical Foods has been a Dudley Square landmark for more than 40 years, and the new location will allow the grocery store to quadruple its size to 40,000 square feet. The former supermarket will remain open while the new facility is constructed and following its completion the building will be redeveloped as a mix of market rate and affordable housing. Later phases for the development at Parcel 10 includes the construction of a 60,000-square-foot, five-story retail and office building at the corner of Washington Street and Melnea Cass. Through an RFP process conducted by the BRA and MassDOT, Madison Tropical LLC was granted designation for the redevelopment of Parcel 10 last May. 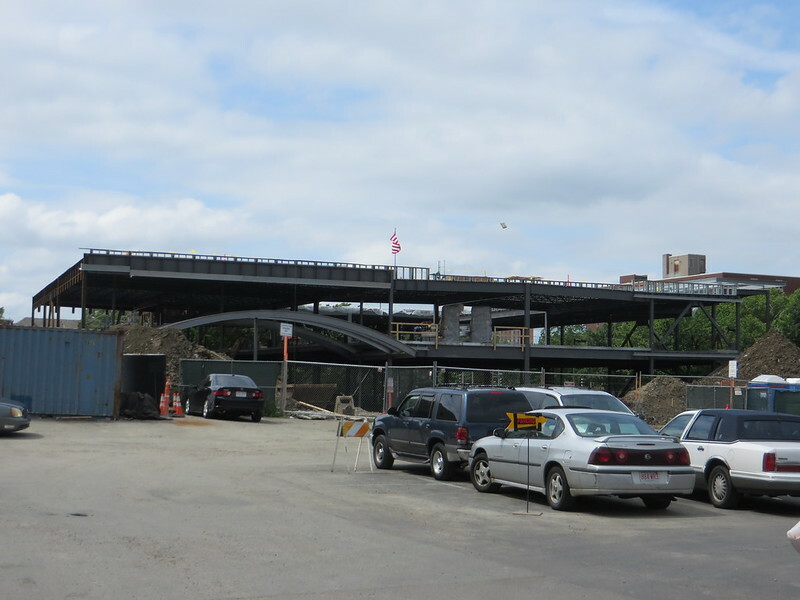 The BRA and MassDOT worked with the Roxbury Strategic Oversight Committee, a neighborhood group, and the development team through the designation process to craft a multi-faceted development program at the site. The redevelopment of Parcel 10 is part of the overall Dudley Square vision, which includes the $115 million restoration of the Ferdinand Furniture building into the new headquarters of the Boston Public Schools and the proposed redesign of the Dudley Square Library. More than $300 million of public and private sector investment has been made in the area in the last decade under the Menino administration, including the new Area B2 police station, the Eustis Street fire station, and Palladio Hall. Since the development is being financed with tax credits, site control is needed before the project can be financed. Sort of a chicken and egg situation--not a misstep in awarding the project. I don't know how but this has already broken ground LOL I walked by today and steel is up. Melnea Cass needs this up and down the entire length. The roadway isn't really that wide. If it was lined with buildings and had normal sidewalks, it would lessen the barrier/highway effect it has going on now. Y U NO PUT RESIDENTIAL ABOVE? Maybe because they don't have the money. This is a one store operation, with much of the financing coming from state and other grants.